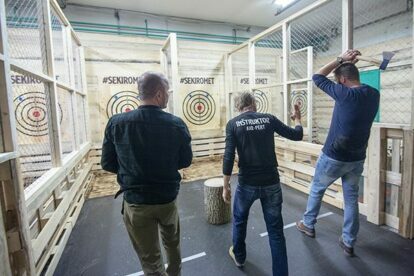 It looks like Ljubljana has been hit with a new trend: Axe Throwing! Sounds lumberjacky? It is. Apparently there is always axe throwing in any lumberjack competition, but recently some actual places have also emerged with this offer. The idea is to form two teams that compete against each other in various games, similar to throwing darts. But the axe is a bit bigger and needs a bit of a different technique, that is why an axe-pert is there. Besides teaching you how to throw, he keeps score as well. The aim is to hit the wooden target according to the game you are playing. Besides the fields that count 1, 2, 3 and 4 points, there is the red bull’s eye that is worth 6 points and two little, blue dots worth 10. Playing is safe and fun. I must admit I was surprised: not only just for the joy of playing but also because I have discovered a hidden talent in me. There is a cozy bar next to it that won’t serve you alcohol until you finish throwing axes.